Holy mackerel, world, get ready: Tyler Lyle is coming in a huge way. Tyler is a 26 year-old songwriter originally from Carrollton, Georgia — although he has successfully expunged his accent (regrettably, says the Georgia blood in my veins). He was in town this weekend for a richly satisfying Fuel/Friends house show & chapel session, leaving the air in my neighborhood radiant with his songs. And yes, he was carrying a timeworn copy of Kierkegaard this weekend; I also believe the mandolin here from Thomas Lockwood might kill us all. I have been raving about Tyler’s album The Golden Age and The Silver Girl since the very first moment I clicked play and heard the opening track. Tyler’s record was one of my favorites of 2011, and I was delighted to spin him on NPR’s World Cafe. But I am here to tell you that he is just getting even better, by leaps and bounds. I don’t think he’ll be anonymous for long. He recently finished helping write songs for the new Court Yard Hounds record (2/3 of the Dixie Chicks) and he talked about what it was like for him to be in the presence of such talented musical greatness, how he once stopped everyone in the middle of a song just to shake his head and marvel a bit. Despite his nascent presence and clear-eyed youth, I often felt the same way this weekend — having to pinch myself at all this magnificent music that Tyler kept infusing our air with. 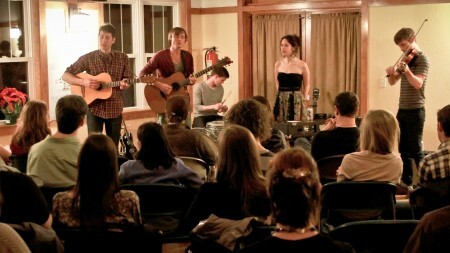 On Saturday night at my house concert, I was excited to realize that I didn’t know half the crowd, which is rare in Colorado Springs. There was an infusion of new people in our cozy little domestic music scene, which I interpreted as evidence that there is a buzz growing around Tyler Lyle through word-of-mouth. Even more incredible was when Tyler stumbled over the words to a fan-requested song that he hasn’t played live in a while, and a surge of voices from the crowd picked up right where he faltered. A good dozen of us sang along the rest of the words with him. I did not expect that. Saturday afternoon I had left Tyler in my house for a few hours to enjoy some solitude, and he was working on writing songs. The crown jewel of the show that night was the first live performance of that same song: the only time it has been played all the way through, and before the ink was hardly even dry from the penning. With the marching cadence and the lyrics brimming with hope, this feels like a folk anthem already. I found Tyler to be thoughtful, deliberate and well-read, traits that seep out all throughout his music — in the lyrics, in the questions he raises, in the bold statements of hope. There isn’t any artifice in Tyler, and I am sure there are dozens of ways we could prod at him with our collective cynicism, for his lack of a defensive coating. But see, I’m built the same way. His music is imbued with the fiery-hearted purity and optimism of ’60s folk songwriters who see a better world and aren’t afraid to tell you that, unblinkingly. Anyone who can sing this purely, “But I have only love, and I’m convinced it is enough,” as Tyler does, is enough for me indeed. Oh, and yeah — they ended the night like this, with some help from our engaging openers John Heart Jackie. Yep. What you can’t see is our sea of wide-smiley faces crowded around them, just beaming. Tagged with fuel/friends house shows, tyler lyle. He sounds like David Gray a great deal. Which I’m totally fine with. Beautiful. Thanks for sharing! Andy, i COMPLETELY thought the same thing. I kept feeling like I was seeing David Gray circa 1994. Ha. So arresting, so incisive. Golden Age is undoubtedly one of my favorite albums of the last year and he joins Built to Spill and Andrew Bird in my list of “my 2012 sxsw would be complete if I saw these guys play”. Any idea if he’s confirmed for Austin and, if so, his schedule? he’s not playing SXSW, despite my exhortations and willingness to spirit him there in my suitcase. he just played SF’s Noise Pop, and undoubtedly this year will bring more shows. GO. duh. I have been waiting for this since you announced your house concert. I wish I could have been there. Thank you for sharing these videos – so wonderful! I’ve been following Tyler since you first blogged about him. Thank you!! I just bought his album without listening to the songs. I have a feeling the $8.53 will be worth it. I can’t believe I haven’t been listening to him all along – his songs are gorgeous. I bought Golden Age as soon as I read this. Thanks for sharing the videos (and would love to see/hear more! ).